These digital instruments provide comprehensive monitoring of onboard AC and DC electrical systems. 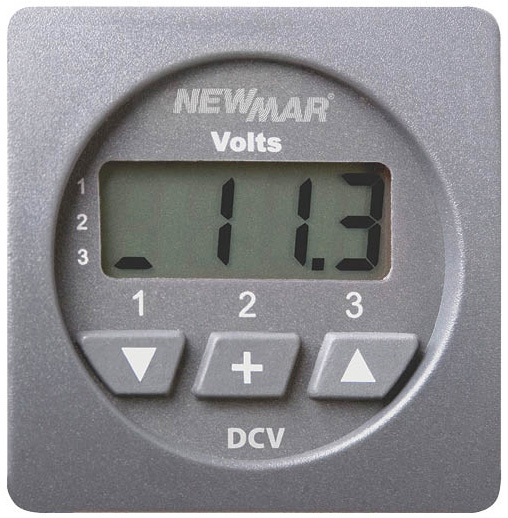 They give quick and accurate information on all important aspects of electrical system status – voltage, current, power consumed, power available, and AC frequency accuracy is +/- 1%. Programmable visual and audio alarms alert of abnormal system conditions: Low/High Voltage and Low/High Frequency. An optional sensor, model DIR, will relay the alarm signal to remote monitor panel/audio devices. All read-out modes and alarm programming of multiple functions are easily controlled via touch-pads on the instrument face. LCD displays are easily read in bright sunlight and feature five level adjustable back-lighting for conservation of night vision. 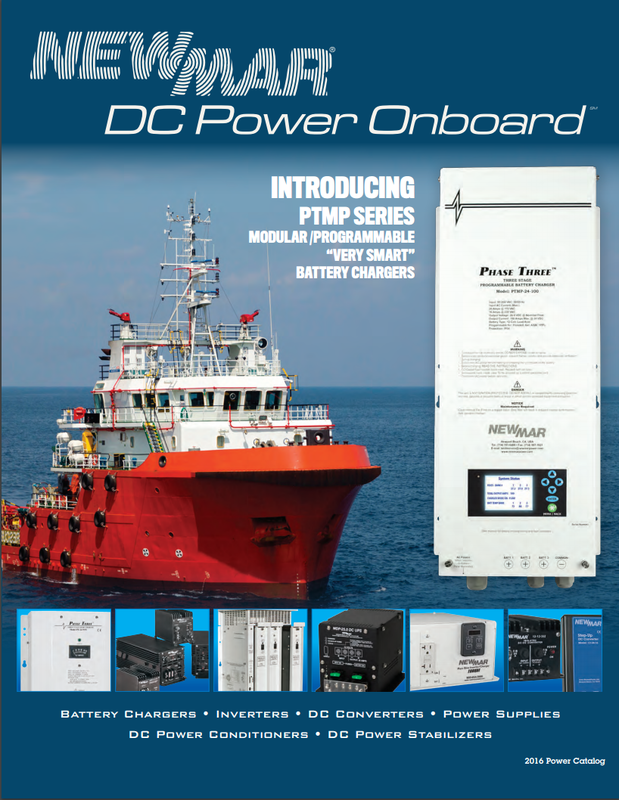 High/low voltage and frequency alarms, and DC monitors are NMEA 0183 compatible. The meter/touch-pad and surrounding bezel are fully waterproof are suitable for installation in exposed above deck areas (provided there is no water ingress to the rear of the mounting surface). All models are designed for through-bulkhead mounting. Large LCD read-out design. Digits are an easy-to-read 1 1/4″ tall, allowing monitoring from a distance. Large button keypads make programming and function selection a breeze! All instrument ratings and functions are identical to the DCE described above. Mounting hole requirements and hardware are also identical to standard scale models. 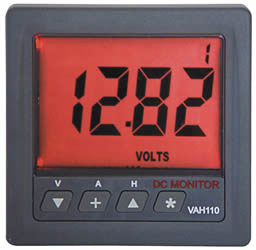 Displays volts, amps, energy used and remaining for 12 or 24 volt systems up to 500 amps and up to 3,000 amp-hour capacity. 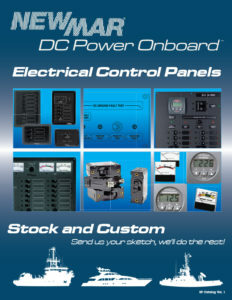 Makes DC energy management a breeze. Monitor voltage on up to three separate banks. House bank (or battery bank of choice) may be also be programmed for the following functions: 1) Monitor charge/discharge amperage. 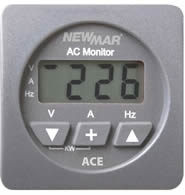 2) Total energy monitor can be set for amp-hours or percent-of-charge. 3) High/low voltage alarm, plus alarm set-point for low amp-hours remaining. 500 amp shunt included. NMEA 0183 compatible output for data logging. Available in 2-1/2″ or 4-1/4″ square face, see below. For 115/230 volt systems. Reads: 90-300 VAC (True RMS), 0-150 amps, frequency from 40-70 Hz and power from 0-45 kW. Features alarm circuits for high/low voltage and high/low frequency. Can be programmed to provide automatic generator shutdown (see Remote Alarm Option on the following page) in the event that voltage or frequency exceed predetermined range. Current and voltage transformers are included. 12 or 24 volt source required to power meter. Available in 2-1/2″ face. size mounting hole and hardware configuration. All instruments shown have programmable alarms. A relay is available that activates remote indicators from the instrument alarm signal output terminal allowing remote activation and/or connection to the vessel’s 12 or 24 volt alarm panel.